Tartan kilt in bottle green with red, white and black plaid. 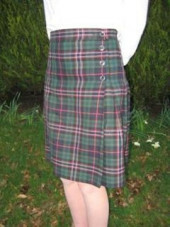 The Senior Kilt (from approximately P4 upwards, depending on size) is a wrap around with button fastenings. Health and Safety considerations do not allow the use of Kilt pins! The Senior kilt has a hidden zipped pocket just below the waist band on LH side as worn. The kilt should be knee length. The kilt is Teflon coated to make it stain and water resistant and is machine washable.